Levenhuk is a major manufacturer of optical products namely their Levenhuk microscopes and is pleased to introduce their line to the US market having been featured and successful in Canada and Europe for years. Their microscopes emphasize affordability as well as quality which has brought Levenhuk to a respectable level in the market. The low price tags, selection, life-time warranty and excellent customer service has caught MicroscopeMaster's attention and so we are pleased to showcase their microscope line for your consideration. 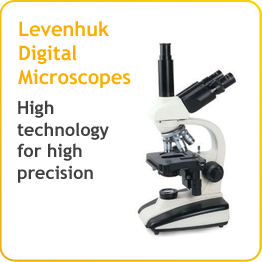 Whether you are a professional, student or hobbyist, a Levenhuk microscope is worth a second look. 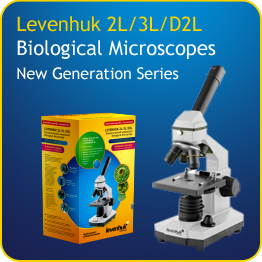 Click through to Levenhuk.com via the banners below for full details on each series offered in their microscope line. Top-notch Digital Microscopes perfect for educational settings equipped and ready for image projection onto PC Monitors or giant screens encouraging multi-full classroom viewing. As well as perfectly suited for advanced research purposes in your lab or institution at a respectable price range. For the more basic needs, the New Generation Series features simple compound microscopes. Most are equipped with two built-in LED illuminations ready for use by your child and student as well as a quality instrument for the microscopy enthusiast. 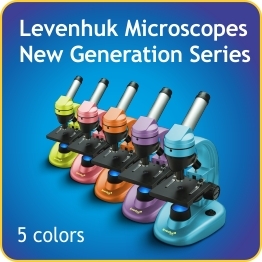 With a range of vibrant colours from the Rainbow Design Series, these microscopes are ready for any hobbyist or student. Reaching a magnification of 1280x, it offers portability and ease of use. Levenhuk is offering creative functional designs to the education market as well as to all professional tiers in research and development. MicroscopeMaster will continue to examine their offerings in the microscope market and in time, produce thorough balanced reviews for your reading and research. Take a look at other Compound Microscopes.